Dragon Quest Heroes: Rocket Slime (スライムもりもりドラゴンクエスト2 大戦車としっぽ団, Dragon Quest Heroes: Rocket Slime?) is an adventure video game developed by TOSE and published by Square Enix for the Nintendo DS. It is the sequel to Slime MoriMori Dragon Quest: Shōgeki no Shippo Dan for the Game Boy Advance. It was first released in Japan, and later in North America. It is a spin-off of the Dragon Quest series. Rocket Slime stars the common enemy and mascot of the series, a Slime, this one in particular being named Rocket. Rocket lives in a town called Boingburg, inhabited by other Slimes, each one being a type of Slime species found in the series. 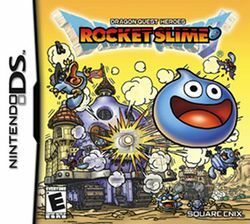 There are no humans in Rocket Slime; instead, its world is inhabited by Slimes and other enemies from the series. It features two forms of gameplay; the first being an overhead style, where the player maneuvers Rocket around a variety of stages, and another where the Schleiman Tank must do battle against an opposing tank, firing ammunition found throughout the first portion of the game. This page was last edited on 18 May 2012, at 21:22.